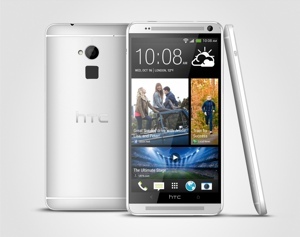 Today, mobile device manufacturer HTC introduced its latest smartphone, the HTC One Max. And man, is it huge. That’s the main feature here, of course – the HTC One Max has a behemoth 5.9” full-HD 1080p display. That’s even bigger than the 5.7” Samsung Galaxy Note 3 phablet. Unfortunately, the HTC One Max shares some of the HTC One's internals, meaning its stats pale in comparison to those of the Galaxy Note 3. You do get a bigger batter with the Max – 3,300mAh vs. 3,200mAh – but you get a weaker 1.7 GHz Snapdragon 600 processor with just 2GB of RAM. You’ll also find 32GB of expandable storage running Android 4.3 Jelly Bean, Beats audio and a fingerprint scanner on the back of the device. The HTC One Max will begin shipping in mid-October. According to HTC, “it will be available in the United States from Sprint and Verizon Wireless this holiday season.” Pricing to be announced. For more information, visit the HTC website.